Like many people, I have central air and heat in my house. When the power goes out, the option of electric heat goes with it. Even if you have a generator, electric heat draws more wattage than the typical home generator can provide. So, you are down to about three options for heating your home. These are: (1) gas, (2) wood, and (3) kerosene. If you have natural gas lines running to your house you may be in good shape or you may not. I remember about 25 years ago when I was living in Dallas, Texas, there was a big ice storm that knocked out power to a large portion of the city. The problem was that it got so cold that the above ground gas meters began to blow up. This left people without electricity or gas; quiet a problem. At this point, propane heaters and Coleman camp stoves where worth their weight in gold. So what I’m saying is, even if you have natural gas, make some kind of a back-up plan. The gas may not be there when you need it most. Some of the farms in my area are plumbed for gas, with gas heaters, gas stoves and gas hot water heaters. The gas is provided by large propane tanks that must be refilled a couple of times a year. This was not a bad system when propane was less expensive. If you decide to go with a home propane system, I would suggest that you go with a dual tank system. In other words, instead of having a 200 gallon propane tank, you would have two 100 gallon tanks with a switch-over valve. This way when one tank runs out, you can switch over to the other tank and have the empty refilled. Using this system you will always have at least a 100 gallons of propane on hand. I personally find propane a little pricey for such general use. I do have a propane cook stove which I run off of a 20 lb. outside bottle. I also have a small propane camp heater that will take the chill off of a room long enough for me to jump out of a warm bed and get dressed in the morning. This little heater runs off of the same size propane bottles as my propane lantern. for taking the chill off in the morning. Wood is my main source of heating whether the power is working or not. Electric heat is just too expensive, and since I live on a farm that has lots of trees, heating with wood just makes sense for me. Now heating with wood may not work for you. Your house may not be laid out in a way that can make efficient use of wood heating, or you may live in town and not have access to cheap firewood, or you may live in a town that has a local ordinance against burning firewood. If that’s the case just skip this section;otherwise, read on. A good wood burning stove is the only way to go when heating with wood. A fireplace is pretty to look at, but most of your heat goes out the chimney. Some fireplaces have attempted to overcome this problem by including blowers that blow the heat out into the room. It’s a good plan but guess what? The blowers run on electricity, so right when you really need them, they don’t work. Like I say, I prefer a good wood stove and here is how my wood stove is set up. I had a friend who’s a brick mason make a 4′ x 4′ brick pad on top of my concrete slab floor. The stove sits on this slab. He also laid a 4′ wide strip of brick from floor to ceiling in back of the stove. This brick serves two purposes; (1) it serves as an insulating barrier between the hot stove, and the floor and wall, and (2) it acts as a heat sink, storing some of the heat from the stove and radiating it back into the room. The stove itself is made of 5/16″ welded boiler plate and is lined with fire brick. It has double doors on the front with asbestos seals around them, and each door has an adjustable damper in it. It can be left open with a fire screen on the front if you want to watch the flames, or it can be closed airtight. The top of the stove is flat and can be used as a cook surface. We usually keep a kettle of water on it to help keep some humidity in the room and to make tea and coffee. My wood stove heats the living room, dining room, kitchen, bedroom, and sewing room. On an average winter day it takes about eight to ten pieces of stove length wood to keep the house comfortable; a little more on cold days. We usually let the fire die down at night and sleep under blankets, then in the morning we’ll throw some kindling on the coals and build the fire back up. Some words of caution: make sure you know what you’re doing when you install a wood stove or get professional help; and, once you start using your stove get it cleaned every year. Creosote build-up in the stove pipe can lead to a fire. Also, keep a fire extinguisher close to your stove. I love my wood stove, and for everyday use, or when the power goes out, I think wood is the way to go; but there is one instance in which I would not use wood to heat. If that sad day ever came when some disaster caused society as we know it to start breaking down, I would not burn my wood stove for a good while. Here’s why, you can smell the smoke from a wood stove for at least a mile, maybe more if the wind is right; and you can see a plume of smoke from farther than that. Remember, staying under the radar is your best defense. Smoke says, “there are people here.” You don’t want uninvited company. This is where my kerosene heater comes in. 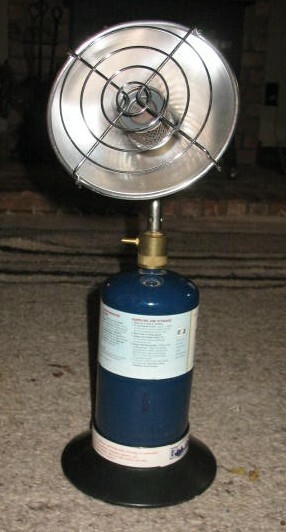 A kerosene heater will do a good job of warming a room up. It emits no smoke and has no smell. One big drawback to a kerosene stove is that you should only burn the super clean K-1 kerosene in it, and K-1 is expensive. Last time I bought any it was 5 bucks a gallon. I checked a couple of days ago and it is now over 8 bucks a gallon. My only advice is to buy what you can afford and then use it sparingly. It may cost a lot, and you may not be as warm as you like; but it beats having the starving hoards show up on you door step. After an appropriate interval, when things have calmed down some and the worst of the craziness is hopefully over, you can go back to burning wood; but I would make it a point to burn the driest, most seasoned hardwood I could find. This will produce less smoke than unseasoned or soft woods. No sense taking a chance if it can be avoided. A final word about heating. Save the heat you already have. Put on a sweater in the house. Wear wool socks. Wear a hat (40% of your body heat is radiated out by your head). I don’t know where we came up with the idea that the world should be 72 degrees year round, but it’s crazy. You can be very comfortable at much lower temperatures. I remember once being on a little hunting trip with some friends of mine. We had walked back into the bottoms behind my farm and planned to spend some time in the woods with squirrel hunting as our excuse. We had only a tarp for shelter and two wool blankets each for bedding. We piled up a thick bed of dead pine needles to insulate us from the ground and slept cool but bearable the first night. That night it snowed, not heavy, but it was definitely cool. The next day we went about our business dressed in coats, hats, and gloves. We spent another night in our blankets and slept quiet comfortable. The next day, even though there was still snow on the ground, we found ourselves shedding coats and going around in shirt sleeves. That evening we walked back up to the house and when we went into the living room it felt like we had stepped into a blast furnace. I couldn’t imagine what had possessed my wife to heat the house up so much. I walked over and checked the thermometer on my thermostat and it was 65 degrees in the room. Moral: It takes very little time for the human body to acclimate to changes in temperature. It’s all what you get used to.